This is another of the Sea Goddess collection! This is okay to use and okay to apply. 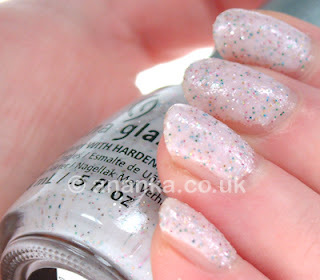 It's not as easy to apply as the last two CG polishes, but is okay once you get a feel for it. Was fairly quick drying too. 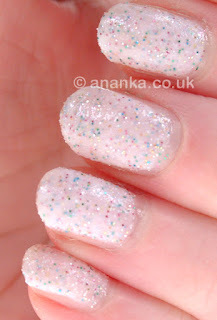 It's a kinda milky texture polish with different coloured glitter and some sparkle. In some lights it looks almost subtly pink rather than milky white. It's nice and lasted well. it reminds me of rainbow sprinkle icing! I love this. Haha yeah - it's cool. Thanks :-) I'm not really a pink girl! Some polishes are okay though.